This 3 piece set is the perfect gift for the baby in your life - 3 classic and beloved baby toys all in one set! 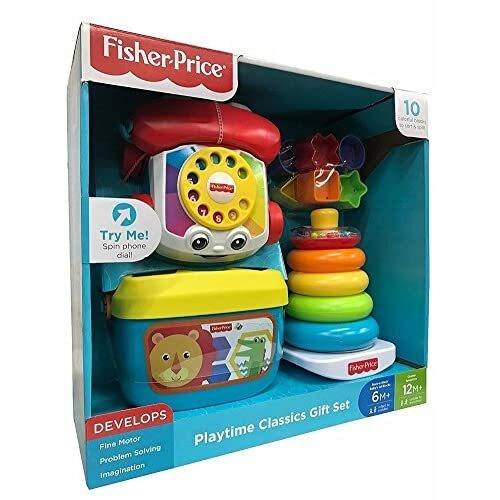 These toys give your baby more than just entertainment - they help them develop critical motor skills and allow you to share the memories you may have of these very same toys. 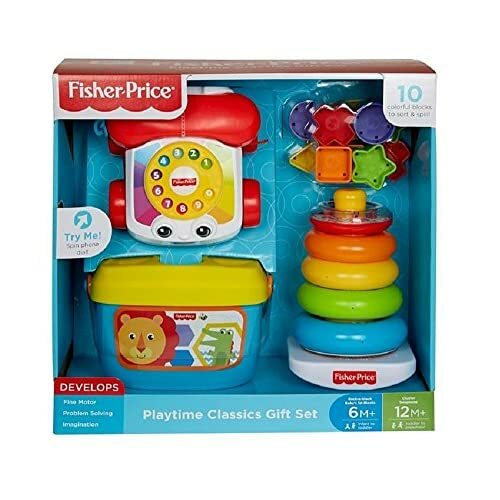 This 3 piece gift set includes a telephone, rocking stacking rings and a sorting cube with 10 colorful blocks. All of these toys develops fine motor and problem solving skills and imagination. The Rock-A-Stack is perfect for babies from 6 months and the Chatter Telephone is perfect for babies from 12 months. The Sorting Cube is great for baby to play with between the months of 6 to 12 and up as they are working on those fine motor skills.